Peace of mind comes when you learn to concern yourself with matters that only concern you. Let go of whatever doesn’t concern you. Give it to God. Be at peace. Otherwise, if you let people dictate every waking moment of your life because of what they think or say about you, you will never find peace. Find your own happiness. God wants us to be at peace. At some point in life there will come a point and time we will decide some situations and relationships are not worth our attention or putting all our time and effort in. We will think about the pros and cons and begin to calculate the losses and the benefits. And will ask ourselves, is this adding to my life or subtracting from it? We then will make the decision to let some things and some people go, so we can be happy and stop feeling uncomfortable. It’s not that we don’t love them but will love them from a distance. We no longer want to deal with the negativity, jealousy, hatred or be inconvenienced. We move on. We choose to let go and move forward. 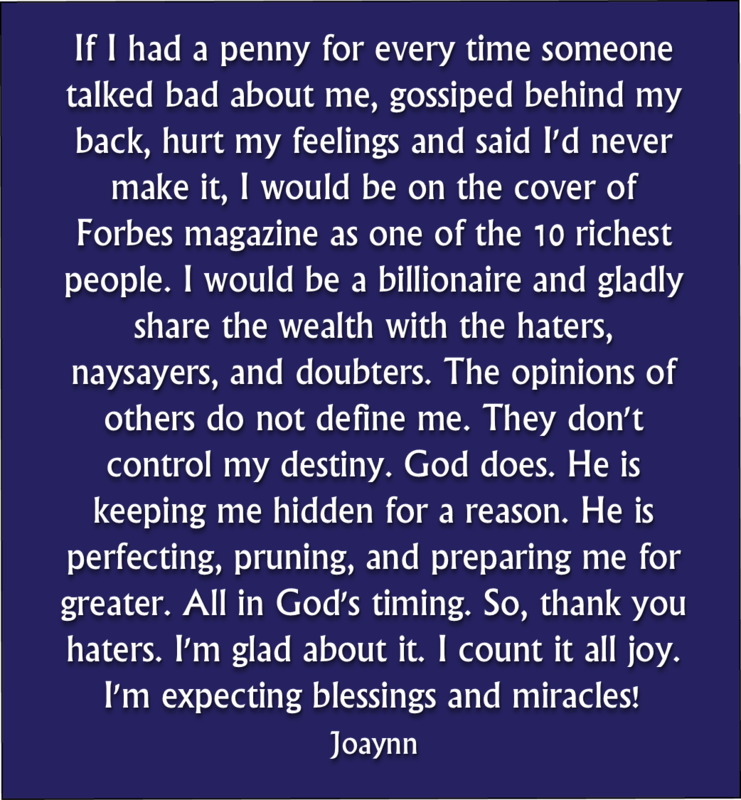 If I had a penny for every time someone talked bad about me, gossiped behind my back, hurt my feelings and said I’d never make it, I would be on the cover of Forbes magazine as one of the 10 richest people. I would be a billionaire and gladly share the wealth with the haters, naysayers, and doubters. The opinions of others do not define me. They don’t control my destiny. God does. He is keeping me hidden for a reason. He is perfecting, pruning, and preparing me for greater. All in God’s timing. So, thank you haters. I’m glad about it. I count it all joy. I’m expecting blessings and miracles! In life we have choices. Stop feeding what’s dead. Dead situations can’t be waken. Choose joy. Live the life YOU want to live. Make it count! Oftentimes it is not until we hear of someone else problems or realize the depth of another person’s struggle that we are grateful to God for his many blessings bestowed upon us. When looking over our own lives, we start counting our blessings, thanking God for grace and mercy even though we didn’t deserve it. For the past few weeks I have not been feeling well and have been in somewhat of a slumber with a lack of energy, motivation, or enough strength to get out of bed and do things my heart so desire. The past year has brought about some insurmountable challenges and major decisions that also contributed to my lacking the ability to finish projects that have been in the works for years. It rendered me helpless and a bit hopeless. However, at times I find that no matter how often I may feel like Job, Jeremiah, and the Apostle Paul all wrapped in one being of myself when going through fiery trials. Failing to understand why I’m still here, I am assured God is with me. I begin to think about all God has done for me and thank him not only for what I have but what I don’t have. Thankful to God for saving me from things I thought were necessary for my success. Later realizing God saved me from things that were not for my good. He is my refuge. While I may not be in the best of health to do what I used to be able to do, I have more than enough strength through God. I don’t allow trivial matters to stop my giving glory to God. I press towards the mark. For the first time in over a year, I managed to reintroduce myself to my book and am trying to recapture my story. I’ve been recording my thoughts to later put on paper, reading over my book, taking notes, and making some edits. I may have had writers block for a long time but so grateful I’m now in a better place to start again, at least collect my thoughts, and pick up where I left off. I said to myself, OK. I have 1, 4, and 5 down pat. Still working on 2 and 3. In the meantime, I began talking to the tv and made declarations, “I’m going to #ActLikeASuccess, I will #ThinkLikeASuccess and I will be one! I am not afraid to reinvent myself. I began to toss around some ideas in my head about my business. I started talking out loud to myself. Speaking victory, envisioning what I could do to make my dreams become a reality. Believing the best is yet to come for me. Oftentimes God will take us through a fiery trial, if need be to break the spirit. That we may willingly yield to the power of Holy Spirit. God can move mountains. I know. Because he said so. No matter how big the problem, say to this mountain, “Move” and it will move. God promised he will do it for you. God is a promise keeper. Take him at his word. He’ll never leave you or forsake you. He’s always with you. He will do what he promised. None of us are strangers to fear. When troubled on every side, God’s grace is sufficient. Fear not. Have faith. His strength is made perfect in weakness. Sometimes you have to think yourself beyond what your mind says you aren’t; and believe that you are. God says you’re more than a conqueror. Fiery trials will come. Rejoice! The greater the struggle, the greater the reward. Each of us have a testimony. We are all going through something. We may not be going through the same thing, but we are all burdened with something. Nothing is too hard for God. Cast all your cares upon the Lord. A simple thought, kind gesture, hug, or simple words of inspiration or encouragement can touch the life of a person you may not know. Be a blessing to someone, wherever you may go. 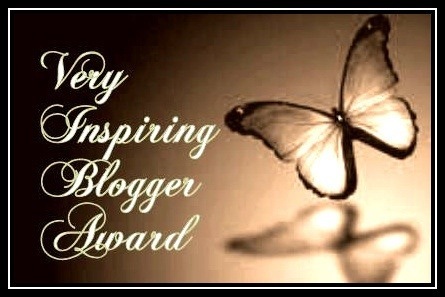 It doesn’t matter what you are going through, work to inspire, motive, encourage, and bless others as God blesses you. We don’t know what others are going through. There’s someone fighting a battle harder than you. 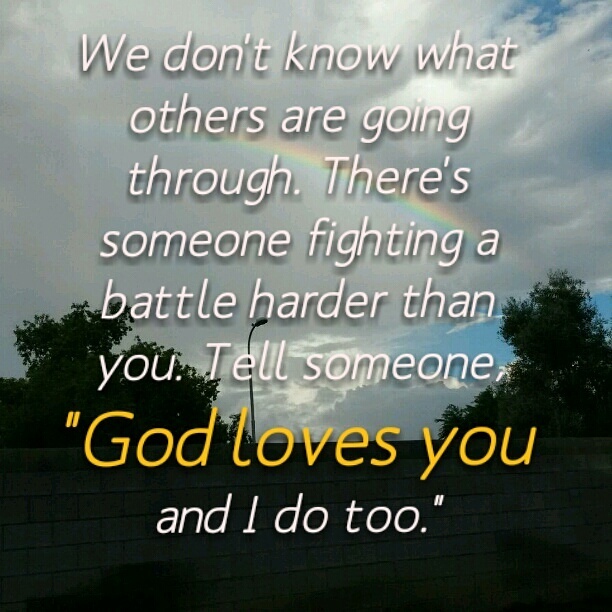 Tell someone, “God loves you and I do too.” Thank you. 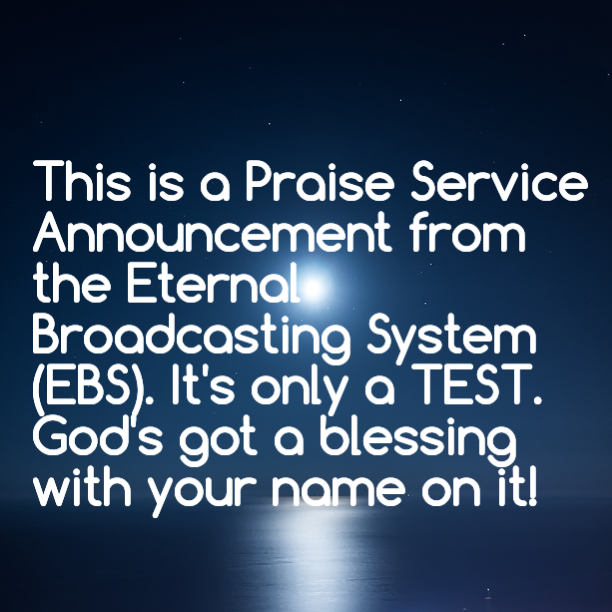 This is a Praise Service Announcement from the Eternal Broadcasting System (EBS). It’s only a TEST. God’s got a blessing with your name on it. A blessing in disguise is defined when something bad or misfortunate happens and the reward turns out to be beneficial. Things turn out for the best. But sometimes if it’s not in our best interest but will have negative consequences that will hurt someone else when compromising your own integrity, is it really a blessing in disguise or should you still consider it a blessing? To selfishly impose your own will and compromise your integrity only to reap the benefit of that which is acquired illegally and dishonestly I think can still be considered a blessing even though your response to it was unwise. You chose to make a decision based on self-gratification rather than selflessness and sacrifice. However, God can still bless you in the mess that may open your eyes. And alert you to the things he needs you to see, to correct it that you may glorify Him. However, we mustn’t confuse the idea that when something bad happens and we are placed in a position where we are helpless but still are blessed as a result of it, with the idea that when something bad happens and as a result out of our lack of integrity to do the right thing, we reap the benefit. But remember, there still will be a consequence. For example, when a person loses a job and God still gives them provision in it. Count it all joy. It’s a blessing. While you may not have a job, your needs are being met. And you can use the free time to spend with family, explore new options to enhance your abilities. Don’t fret. View it as a time to put life into the right perspective. Create new goals. God’s taking you to the next level. In contrast, when a person goes into a grocery store and the clerk gives them way too much change. And they realize it but still walk out of the store with money in hand. Never once thinking twice about going back to correct the situation and make amends. Instead they think it is a blessing because they now have more money than they had. They believe their response to it was good and not bad. Their conscious was not affected at all. And in the long run, the deed was not good. Therefore, the reward cannot be justified. It’s already done. Consequences will come. This past weekend my daughter blessed me to indulge and treat myself to some much needed shopping. So I went to the mall with my oldest daughter to see what I could find. I went to an upscale department store to look for summer dresses or dresses to wear to church and found a few I wanted to buy. I decided to walk around the store to make sure there wasn’t anything I missed before leaving. As I’m walking to find a cashier to hold my merchandise until I returned with coupons my daughter had who was in another part of the mall, a sales lady in the purse department stopped me in my tracks and asked loudly could she help me. The encounter seemed strange. I sensed a slight bit of stereotypical behavior when she looked me up and down with question and yelled out to me as if I was going to walk out the store with the merchandise. My first instinct in response to her question was not in why she approached me but the manner in which she did. Granted I was not dressed in my normal attire, not that it mattered. But based on the type of people I guess they are accustomed to who shop in the store, maybe I didn’t fit the part. Not to mention the clothing department items were relatively expensive and may have exceeded my budget but not my taste. However, there was a terrific sale going on that I could not pass up. Being the person that I am, I overlooked her approach and asked that she hold the items until I returned. Her answer was yes but she noted with this weird look over her glasses, “We close at 9, so if you decide you don’t want the items we’ll make sure to return them to the proper department.” I thought “strange” given the fact I previously stated my intention was to return to the store. I brushed it off. I returned 30 minutes later before store closing with the coupon and by the look on her face and the tone of her voice, she seemed surprised and flustered but helped complete the sale. There was a 20% store coupon offer available and I had a $10 coupon. I thought I could use both savings but the system wouldn’t allow it. After she rung up the sale, I advised her I wanted to pay part in cash and the other part on my card. However, when she entered the information and asked that I swipe my card, the machine would not take it. She immediately said, “It must be an error with your barcode. Give me the card to swipe. She looked at it and said, “Oh, this is not a department store card but a debit card from your bank.” Hmmm was all I could say as I commented “yes.” Before she could swipe the card though, the machine automatically completed the transaction and as she went to hand me the receipt, she had this odd look on her face. She asked, “You paid $30 in cash right?” I said, “Yes.” Thought nothing of it, and took my bag and left the store. When I arrived home I looked at the receipt and noticed there was $4.80 in change that was to be given back however, something appeared to be wrong given the fact part was to have been paid in cash and the other charged to my card. So I called my bank and the charge was not there. I looked at the receipt again and noticed her error. She entered $30 cash twice which is why the $4.80 change amount appeared on the receipt. I immediately called the store in an effort to reach her because my first thought was I didn’t want her to get in trouble or she lose her job because her drawer would be short as a result of the error. But the store had closed and I had no choice but to wait until the next day. For some reason I couldn’t sleep and felt I needed to make this right. I woke the next morning, waited for the store to open, and called and spoke with the sales lady. I tried to explain what happened but she didn’t understand. She said with hesitation, “If I made a mistake and overcharged you, come in and it can be corrected.” She sounded frustrated. I dismissed it. And confirmed I would be in later. What a blessing. Thankful the Holy Spirit convicted me to do the right thing regardless of what my pocketbook may have led me to do. I made a conscious decision to correct what could have turned out bad. And most likely it would not have benefited the sales lady or me in the long run had I chosen to keep the merchandise and believe I rightfully deserved it. Additionally, the cashier mentioned the sales lady’s drawer was not short at all when she logged in that morning. She said however, had it been short the sales lady would not have been reprimanded because of a change in store rules. Wow. To think, she may have been okay on her end but for me, it may not have been so easy. My conscious would have eaten at my core existence and eventually I would have paid the price for making a bad decision. It was a test of my spiritual integrity. All things happen for a reason. Even though store personnel couldn’t see it at the time, my heart told me my commitment to God and my honesty in making a wrong right allowed each of us to be blessed by it. I may not have received acknowledgment from my peers but I could feel in my heart God was pleased. Things were brought together by God and worked out for the greater good. All glory to God. Oftentimes you hear people say in situations like this, “It’s a blessing in disguise, because you managed to get something for “free” without having to pay for it and saved money while doing it.” But I say in actuality you didn’t because it was not yours to begin with. And given the fact it was not acquired legitimately, it was not yours to have. You did not deserve it, unless you rightfully paid for it. Moral of the story: While I may have had the opportunity to save money even though it may not have been in good faith or in good deed, a loss still would have occurred later. Not only for me, but for the other person involved as well. And we both would have suffered irreparable consequences in the end. No one would win. A blessing in disguise is something that appears to be bad and the reward turns out beneficial. It is something we cannot see. Or it can work within us even when others are not able to see. Random acts of kindness, sharing a smile, or an encouraging word with someone can be a blessing. Count it all joy. God’s work was done through you. He sent you. He blessed them through you. A blessing in disguise is an act of good will. It is a blessing of good will. Sincere blessings come from the heart. Show love, inspire, encourage someone. Be a blessing to others. Let God’s will, not your will, be done. Jesus tells us to obey God’s commandments. We can do this with our heart, our will, our mind, our body, our finances, and our future. Love God more than any relationship, action, achievement, or possession. Commit yourself completely to him. Seek to know him and his Word. When you seek to know him and his Word, his principles will become the foundation of everything you think or do. It will shape and define you. Recognize that your strengths and sexuality are given by God to be used for fulfillment according to his rules. Don’t confuse it with your rules. Make conscious decisions about your finances. Know that all resources you have ultimately come from God and that you are managers, not owners of them. Let your service be to God and make man the purpose of your life’s work. When you follow God’s commands, He will give you all that He promised.